The Tiny House Movement has surely created a buzz across the nation. Advocating simple living in small homes, the movement is causing home owners to opt for less than 1,000 sqft. while some owners go as small as 80 sqft. In the United States the average size single family home grew from 1780 sqft in 1978 to almost 2500 sqft in 2007, despite a decrease in the size of the average family. Tiny Homes popularized by Jay Shafer who designed and lived in a 96 sqft house and later went on to offer the first plans for tiny houses on wheels and founded Tumbleweed Tiny House Company. Since the financial crisis hit in 2007-2008, the small house movement has attracted much more attention. 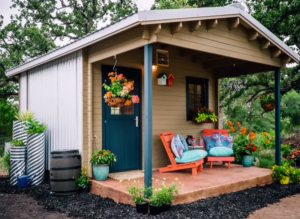 Tiny houses are trending everywhere across the world, offering affordability, some mobility, and are also ecologically friendly. Could you live in 500 sqft home? It would definitely be tough, and most certainly has its pros and cons. So what’s the price, right? Every trend, just like every dog, has its days. But this one, I believe, is making a huge wave across the borders and may be here to stay. The average price to get your tiny dream home underway is anywhere between 20k – 50k. Keep in mind, if plumbing and electrical are important to you, be sure to account for that to be a large sum of your final budget. Some people like using compost toilets, but let’s be real here…it’s 2015 – There’s too much innovation to be living like a pilgrim. Technically speaking tiny houses are categorized as “accessory dwelling units”, or ADU’s, and meant to purpose as additional housing on a property for aging relatives, kids returning from school, or a guest house. When we speak in terms of taxes, building, heating, or maintenance, you’re definitely cutting the cost of living. Although, tiny home owners would encourage you to keep cutting and simply your belongings as well. You can’t keep the deer heads in the 7×7 master loft, now can you? The tiny house community and its advocators have received some great media coverage which in turn has created a popularity increase. With popularity comes stipulation, though right? Safety and zoning regulations have become a raised concern. Builders typically require a minimum square footage for new construction on a foundation, which most tiny homes are regulated to have. This causes new tiny home owners to play on the scales, balancing and deciding what factors of this new lifestyle are most essential. Some towns prohibit you even keeping your new quaint little home on your property if it sits on four wheels due, to what’s called in some cities, “camping regulations”. If you are considering down sizing, simplifying your life, living like a gypsy, or maybe its just you and your dog heading out to chase the sun, consider any and every city regulation before you settle down. Check out the link below to learn everything there is to know about tiny houses.